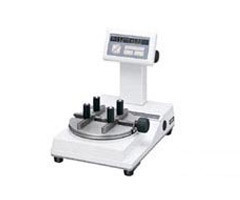 Table top, manual load, digital torque meter ideal for cap testing. For checking bottle cap tightness, starting torque test, strength test, etc. Designed for multiple purpose, such as checking cap tightness, tightening torque test, measuring output torque of rotary resistance, measurement of spring force, various strength tests, etc. Universal built-in clamping fixture allows for a wide variety of parts to be easily checked. Up to 50 different torque values may be stored at one time and also sample number, maximum value, average value and standard deviation among stored data can be displayed. RS232C output connector permits the TME to be interfaced with PC or Tohnichi printer, model EPP-16M2. Large-size 7 segment LEDs are adopted and the display panel can be adjusted to the most efficient reading angle. Available for inspections torque drivers.